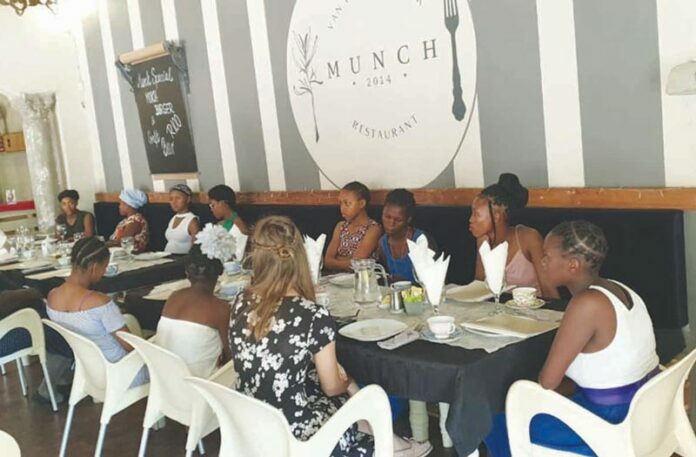 Qualities of a role model “I had a very good experience at the restaurant and I am grateful for the opportunity that I was given to go to the High Tea and spend quality time with the girls”- one of the young guests said. On Wednesday, 20 March, members of MARC (Mpumlanga Addiction Rehabilitation Centre), hosted a High Tea and invited five young girls from Uzwelo Home which are currently undergoing treatment with MARC. The girls were encouraged to have respect for themselves and they had a debate regarding “What I love about myself and what I don’t love about myself”. They also heard the beautiful poem Phenomenal Women, by Maya Angelou (American poet), which they hopefully took to heart. The guests appreciated the manner in which Ms Gontse addressed them. It made them feel unique and special. They found it easy to communicate with her and had a splendid time. One of the girls added that they enjoyed the delicious sandwiches and malva pudding, together with the lovely music, playing in the background. Thank you to the members of MARC for an unforgettable morning! “Pretty women wonder where my secrets lies. I’m not cute or built to suit a fashion model’s size, but when I start to tell them, they think I’m telling lies.